Westporters own 266 electric vehicles. That’s the 3rd highest number in Connecticut. Greenwich leads, with 511. But — at 1% of our total registered vehicles — we do rank first in the largest number of EVs per capita. That’s 3.5 times the statewide average. Those are a few of the interesting facts to come from the Connecticut EV Club. That’s the new name for the Westport Electric Car Club. As EV popularity rises — there are 35% more plug-in vehicles in the state than a year ago — the local organization is growing too. 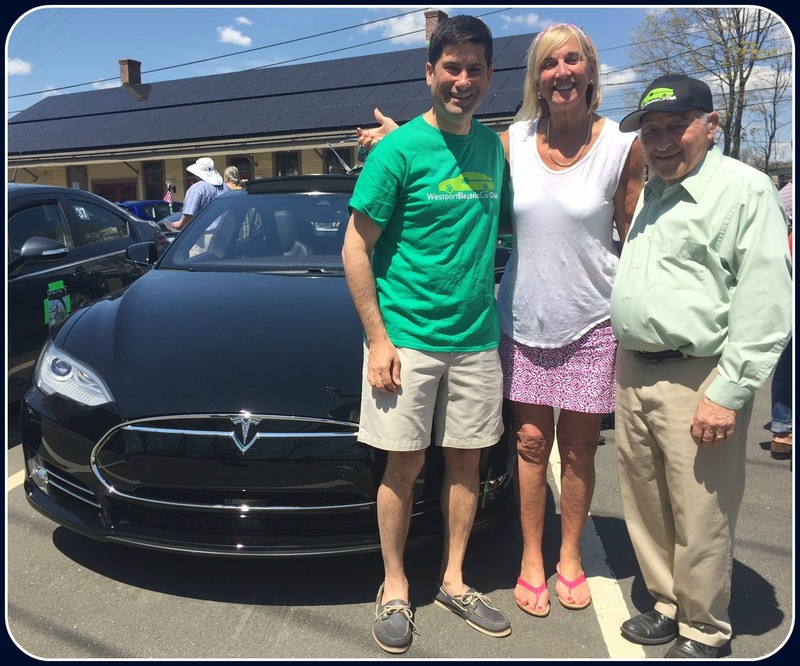 Robin Tauck (center) lent selectmen Jim Marpe and Avi Kaner (left) her 2 electric vehicles at an Electric Car rally. Kaner liked driving it so much, he bought this Tesla P85D model. On the right is former Westport Electric Car Club president Leo Cirino. Bruce Becker is taking over from founder and longtime president Leo Cirino. Other changes include partnerships with groups like the Acadia Center and Lime Rock Historic Festival, plus conversations with state transportation and energy officials. State residents have reserved over 3,000 Model 3s — Tesla’s highly anticipated $35,000 vehicle. Club officer Barry Kresch estimates that 250 to 300 of those are in Westport. And, he says, with 20 or so public charging stations — including both train stations, the library and Staples High School — Westport’s commitment to electric vehicles remains strong. Electric vehicles lined up by the Staples charging stations (from left): Chevy Bolt, Tesla S, VW, Tesla X, Nissan Leaf. This entry was posted in Environment, Organizations, People, Transportation and tagged Barry Kresch, Connecticut EV Club, Leo Cirino, plug-in vehicles, Tesla 3, Westport Electric Car Club. Bookmark the permalink. The idea of electric cars is great. But if you really want to make a difference, you might want to think about your lawn and gardening equipment. According to experts in California, gas-powered gardening machines (most notably, leaf blowers) are about to surpass cars as the worst air polluters, spewing out formaldehyde, benzene, and particulate matter. And the ozone levels are already terrible in Westport–the worst of 26 towns in the Tri-State area. The health consequences for residents–especially children–are well known. If you’d like to learn more, email ContactSaveWestportNow@gmail.com and we’ll send you the facts. In the meantime, you might take a hard look at the type of equipment being used on your property. The State of CT collects a gasoline tax to pay for the roads and bridges. As more and more electric cars are manufactured and become a bigger portion of the cars owned by CT residents, less and less gasoline taxes will be collected. Therefore the CT Transportation Fund will dwindle and will go broke. What is the solution in CT? Very few people are able to buy a Tesla (P85D) for well over $100,000, let alone two….but what is the true cost of the $35,000 model?